Mr. Carter had already tried to raise consciousness about energy with a speech two years earlier, in April 1977. “This difficult effort,” he said then, “will be the moral equivalent of war.” Moral equivalent of war led to the unfortunate acronym MEOW, which seemed especially apt when neither congressional action nor ­public mobilization ensued. Jimmy Carter was elected largely because he promised never to lie to the American people. Of all the ­un-Nixons on offer in 1976–the ­Democratic primary field included Sens. Frank Church and “Scoop” ­Jackson–Mr. Carter was the most convincing. But his administration never seemed to gel managerially; most of his programs went nowhere legislatively; and he turned out to be aloof and a little prickly. (He confided to his diary: “It’s not easy for me to accept criticism and to reassess my ways of doing things.”) Democratic leaders worried that Mr. Carter was turning into Nixon, but without the charm. By 1978, a movement to draft Ted Kennedy for the 1980 presidential race was flourishing. By May 1979, Vice President Walter Mondale was contemplating resigning. How did the word “malaise” come to be attached to Mr. Carter’s speech and somehow to sum up this sorry period? While the address was being formulated, numerous policy wonks and public moralists were consulted. Among them was the ultimate Washington insider, Clark Clifford. Several days before the speech was finalized and delivered, Clifford told an interviewer that Mr. Carter had been worried about a national “malaise.” That word–so resonant, so unusual, so profound-sounding–was immediately fastened on by reporters and pundits. 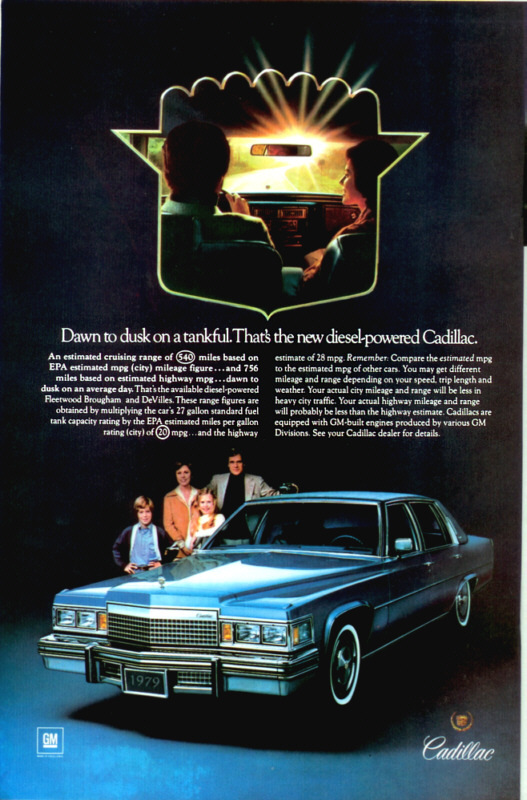 With all the talk about “new GM” and “new Chrysler”, new fuel efficiency standards, hybrids, electric cars, and everything else that seems to have created a rather dense cloud of uncertainty about exactly what kind of vehicles we will be able to buy in five years, I thought it also might be fun to turn the time machine back to 1979 and take a look at the compromises Detroit was having to make in order to keep Americans from defecting to Toyota and Honda and Datsun and Volkswagen, whose cars were selling like hotcakes at the time. Cheaper materials (especially plastics and vinyls), thin body metal, emissions controls that suffocated engines and killed performance, and grossly undersized power plants were just some of the problems that plagued the poorly-constructed, downsized vehicles that a seemingly clueless Detroit began to turn out during the mid to late 1970’s. Advertisements for American-made cars seemed to fall into two distinct categories — fuel efficiency (unbelievably optimistic gas mileage estimates for bigger cars, newly-downsized versions of popular models, or new mid-sized and compact models) and luxury (over-styled full-size automobiles whose ads always featured beautiful, smartly-dressed models or actors in picturesque or elite locales, and never mentioned gas mileage). 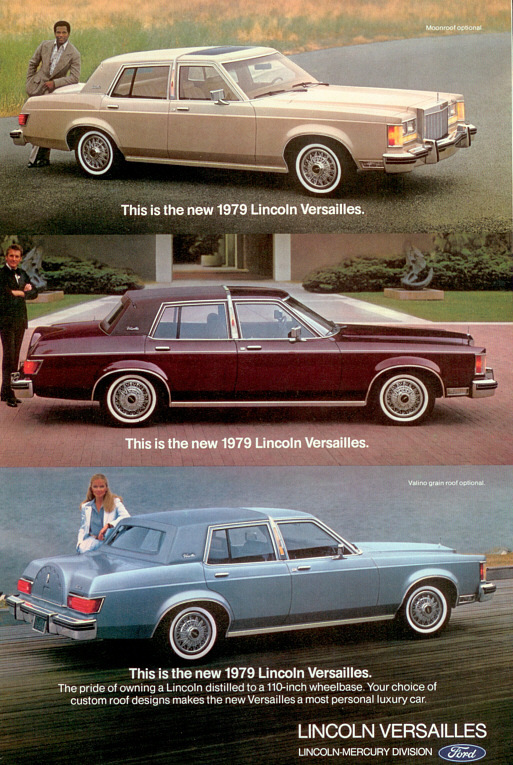 American car manufacturers still dominated the market for enormous, gas-guzzling land yachts, but even those automobiles suffered from severe under-powering (like GM’s anemic small-block V-8 that, in an Oldsmobile Delta 88, could get you from 0 to 60 in just under 15 minutes, or their failed attempt at refitting their gasoline V-8’s as diesel engines).